(Newser) – California rushed to approve legislation Friday that would allow a man with HIV to receive part of his HIV-positive husband's liver before the surgery becomes too dangerous, possibly within weeks. The federal government recently authorized transplants of HIV-infected organs to patients who have the disease, but it still had been illegal in California and more than a dozen other states. The state Legislature rushed to approve the measure Friday, and Gov. 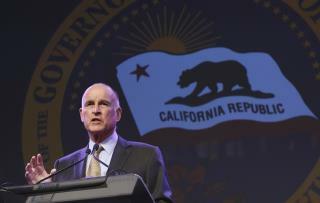 Jerry Brown signed it, the AP reports. Brown spokeswoman Deborah Hoffman says it's "a life-saving matter." Awsome, some of the problems solved. What characterizes them as a husband or wife? Males usually use the term 'husband' and females 'wife,' so sexist on their part and distorts terms denoting heterosexual couples.